how i transformed my bedroom with... paint! I didn't want to have another grey room in the house which is already turning into the home equivalent of #fiftyshadesofgrey so wanted to go for something completely different. 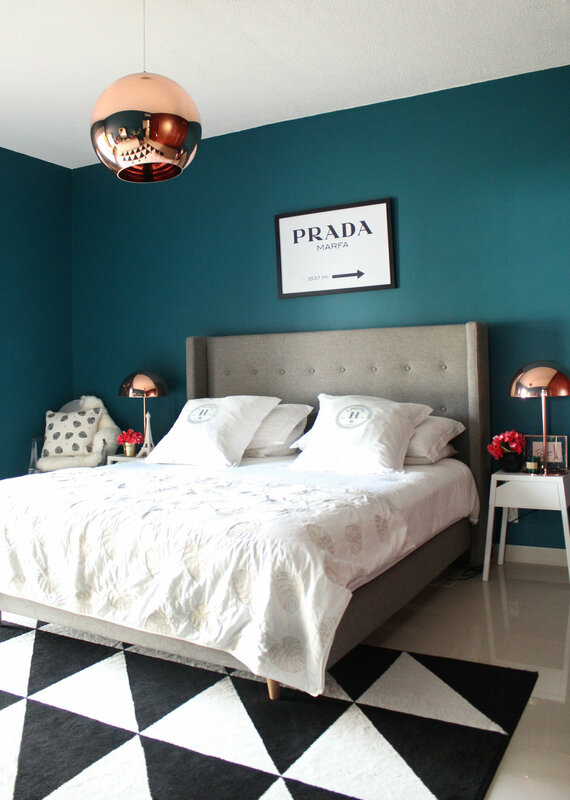 I hesitated between emerald and teal and then this bedroom inspo image kept virtually following me everywhere I went on Pinterest... Let's just say the 'teal' deal was sealed and I then embarked on my quest to find the perfect shade of teal for my bedroom. But before I go on any further, let's have a look at the result?! I already had most of the furniture. I bought the super affordable upholstered bed from Mobilia when we moved in, as well as the bedside tables (a steal from IKEA). The acrylic chair is from Dragon Mart. I am in the middle of a mini-revamp of my home office and had these floating BESTA cabinets from IKEA that I moved to my bedroom. I just replaced one of the cabinets with drawers and added a faux marble top et voila! The perfect bedroom storage for all my knick knacks and underwear/socks which are now perfectly organised in drawers. Marie Kondo would be proud. My old rug felt a bit subdued with the new wall colour and I needed something with a bigger size for the room. So I swapped my beloved IKEA geometric monochrome SILLERUP rug - I love it against the teal walls so much, it actually hurts. And it clashes perfectly with my existing striped blind... Tragically I recently found out they've discontinued this series. Why, IKEA, WHY?! One of the very few items I brought back from London with me is my all time favourite copper globe pendant light from Tom Dixon. I don't think it's possible that I'll ever get bored of it. It's timeless and I literally can't get enough of it coupled with the teal walls. It's a match made in interiors heaven. The matching copper table lamps are little gems I got from the sales at IDdesign last year. The brass mirror is an oldie from Pan Emirates - I don't think they stock that particular model anymore but it's definitely worth checking out their stores as they always have some little bargains on mirrors. And yes it's OK to mix metallic accents guys! The black table lamp is another gem from IKEA. The 'You + Me = Awesome' print is from Etsy (find similar here). The small gold Zebra tray is from Maisons du Monde. The mirrored jewellery box is from Zara Home. The monstera leaf embroidered decorative cushion on the acrylic chair was a gift from Elizabeth Scarlett. So there you go. My little teal tastic revamp. Let me know what you think? Have I gone too bold? Did you prefer the room with white walls?! Let me know your thoughts in the comments below. All the photography is by Stella + the Stars' fairy Sabina Mustafa.